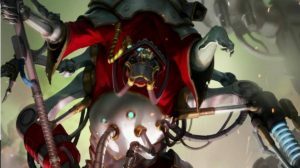 Hello everyone, Danny here to talk about a faction that I haven’t really given much love to, but a faction that constantly whispers to my Golden Age Science-Fiction fetish, Cult Mechanicus! All models in this formation must form into a unit, even though this is not typically allowed. The Dominus may not leave the unit. Adept of the Cybernetica: The Dominus counts as a Data-Smith in all manners, but he also allows the unit to switch protocols immediately rather than at the start of the next turn. Targeting Overrides: If the Dominus/Data-Smiths do not fire, a Kastellan can fire at a different unit. Ok, so with this formation, at minimum you have 4 big, beefy 30s robots and 3 characters that each can bring some different wargear and relics, all in one super unit. Yay Deathstars! If you like T7, this is the formation for you, and you can field one hell of a shooting unit that also has some mean, mean pop in melee. Ok, so I like big giant robots. And you are right to do so, sir and/or madam. This is one way to make a super unit that doesn’t quite feel the same level of cheddar as Superfriends, and unlike other Deathstars, this is one that shoots like a champ. It makes a great center piece to an army. So the baseline Kastellan is a beast with a torrent flame weapon and built in powerfists, all at T7 with 3 wounds and a 5++ against shooting that also reflects attack on a roll of a 6. Being immune to S3 isn’t really terrible, and even Scatbikes need 5s to wound. They are also packed with customization as you can replace the flamer for a S6 AP3 heavy 3 gun with Lumigen (-1 cover saves if you hit), and you can replace their powerfists with a lighter version of the big gun. As they are monstrous creatures, you can fire it all in the same turn, so each Robot can start to pump out a lot of shots. 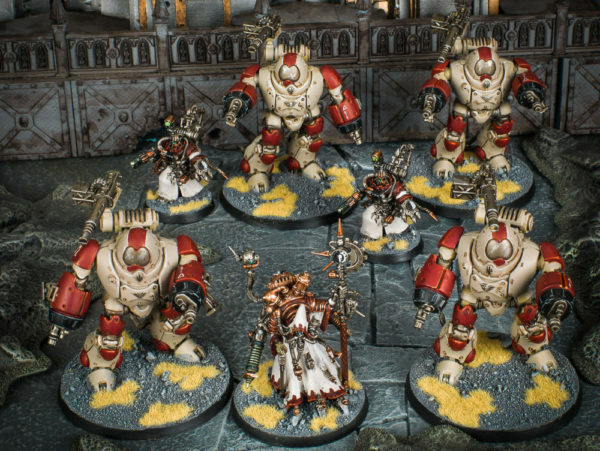 The Kastellans also have a lot of flexibility with both Canticles of the Omnissiah and their Battle Protocols, which can give them huge boosts. For basic defense, you can go with Aegis Protocols for Feel No Pain (quite nice on a T7 model), you can go melee powerhouse and double their attacks with Conqueror Protocols (but no shooting), or allow them to shoot twice a turn with Protector Protocols (but no moving). You can really start to pump out the shooting with these Robots, especially since if the Data-Smiths/Dominus do not shoot, they can start to select other targets, or go into melee beast mode with a ton of S10 attacks at initiative 2 (which is key as this is before unwieldy characters and before Stomps). The Data-Smiths and the Dominus are not slouches either with 2+ saves, Feel No Pain, and a ton of cool upgrades. 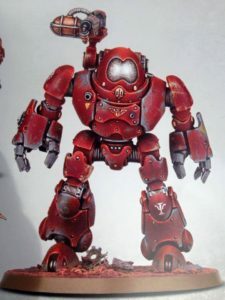 The biggest is that they can take a relic to give the whole unit It Will Not Die, meaning those robots can start to heal, and thanks to Fall of Cadia, Cawl himself can replace the Dominus, so you can have a huge, tanky character that also heals to absorb the bigger shots while the Robots get to work. You can also take a relic to immediately activate a new Battle Protocol, but you lose that Protocol for the rest of the game, but this can insanely life-saving. Wow, so why isn’t this like everywhere? Well, it has a few issues. The first is that it is definitely an eggs in one basket scenario. 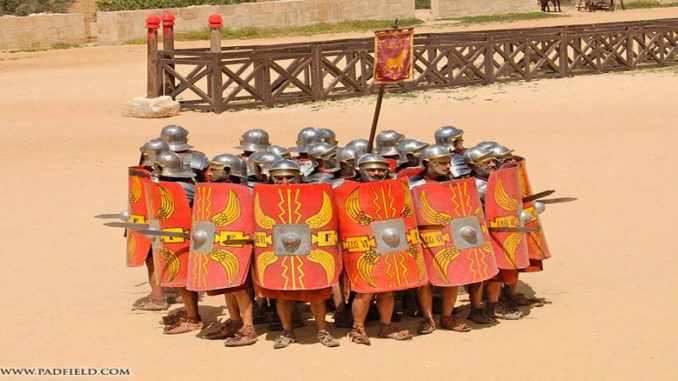 This is not a cheap formation, and even at minimum, you are paying around 700 points for it, and you can easily make it an army unto itself. As it lacks Obsec and can only control one objective at a time, it cannot really contribute much to the mission outside of the Relic (but it is a beast in Kill Points). 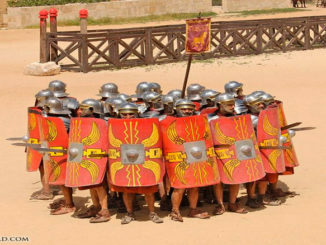 You really have to build your army around this formation, mostly taking a lot of Obsec units to help you play the mission as otherwise, you are going to lose most games, even if you are killing the crap out of your opponent. The unit is also SLOW. It only moves 6 inches, and it wants to shoot, so you are just going to have to trudge up the board. This means it is likely never going to be the one to charge, and it is easily outpaced by faster units. Really, the standard Eldar Jetbike unit should never be charged by this unless they choose for that to happen (or screw up). It also makes it hard for the unit to actually go and get the Relic. 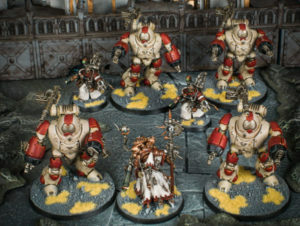 It also does not ignore difficult terrain, so it is definitely possible (I’ve seen it happen) for the unit to roll three 1s for movement and get stuck in the same piece of terrain for most of the game. 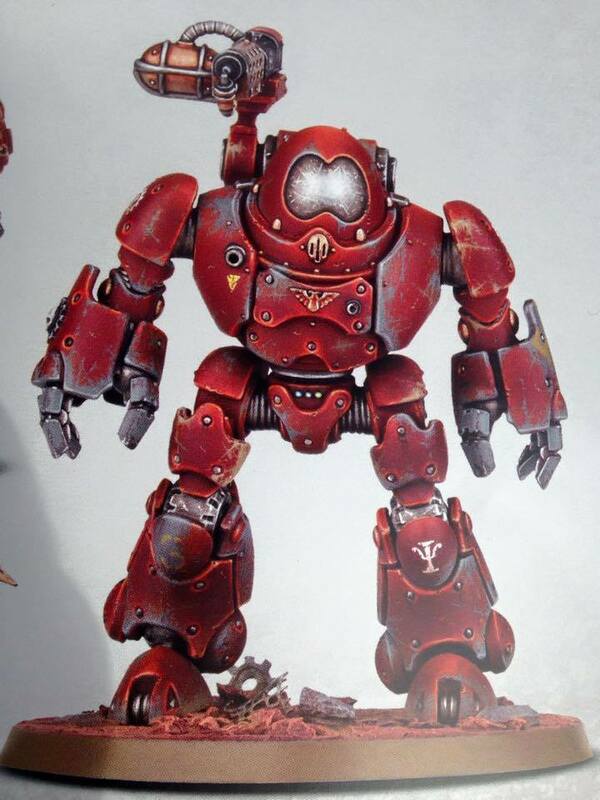 The unit also has no psychic defense, so it is easy for it to get crippled by a psychic heavy army. With Daemons, Magnus, Conclave, Cabal, etc, etc, there are just too many psychic threats that will make this formation suffer and suffer hard. You could certainly add in a Conclave or your own psychic battery to try and get some defense on them, but really, without a psyker in the unit, they have little chance to really Deny the Witch any nasty maledictions. So there you go, a fun, awesome formation that lets you go crazy with the big robots and play a rather elite, small army, but a formation that just lacks a few key strengths to really be the top of the cheese wheel. As always, thank you for reading, check out the TFG Patreon, and if you have a formation that you want featured, just let us know.